Shri Pranab Mukherjee is now President of India. Though we have freedom of expression in our country but making personal observations or predictions about such a dignitary should be beyond anyone’s scope of writing. So I am not making any comment on his horoscope here, however, as an astrology scholar I am inquisitive about his horoscope. I know India’s reputation will reach greater heights under the able leadership of our new President Pranab Mukherjee. I am just elaborating effects of combinations (astrological aspects) of the planets in President Pranab Mukherjee’s horoscope, in general. 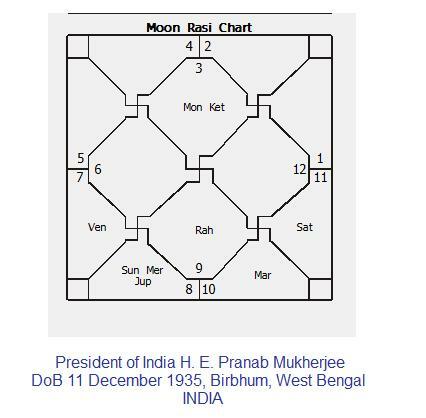 As the time of birth of Pranab dada is not available with us at this moment his Moon chart is being interpreted. In all permutation and combinations; eight probable ascendants out of twelve he would be having Pancha Mahapurusha Yoga as he has Exalted Mars in Capricorn (Ruchaka Yoga) and Saturn in own House in Aquarius (Sasha Yoga) and Venus in own house Libra 10 degree ( to be more precise it is of Mool Trikona) Malavya Yoga. Gemini is zodiac sign ruled by Planet Mercury and nobleness of a human being (Bhadra Purush in Sanskrit and Bhadra Manush in Bengali) in Astrology is affiliated with Mercury this is the reason name given to Mahapurusha Yoga caused by Mercury is Bhadra Yoga. In Astrological references such combination of Moon-Ketu in Gemini constellation was considered ideal for war chiefs’ role the excellent knowledge to deal with opposition with analysing capacity of pros and cons of any kind of situation makes the jaatak known combatant and specifically making war strategies at headquarters, away from war front. Gemini being airy sign gives intellectual strength and enduringness. The similar combination in does not give tough and robust physique essential for a soldier of ancient times unless denoted by other planets in the horoscope. This is also interpreted in different words that the native might not appear that strong by appearance or body language as these planetary combinations make them decent, witty and grounded (they know their footing), but one should expect strong moves and iron hand dealing from them when the are challenged as The jaatak has strong perseverance for the plans and projects and makes way for his goals in long term. They are not nimble at all as long term effects are always on their back of mind. Budhadiya Yoga is taking place in his horoscope in Scorpio sign.